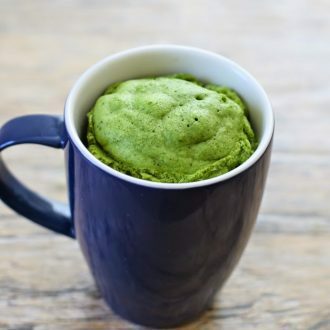 This single serving matcha green tea flavored mug cake has a strong green tea flavor and beautiful natural dark green color. It cooks in the microwave and is ready in minutes! I’ve received a couple of requests for a green tea mug cake, so here it is! I really love the color. This cake is light and fluffy and mildly sweet, letting the matcha flavor really shine through. If you prefer, you can add more sugar, but I prefer my green tea desserts to have a strong tea flavor. P.S. If you enjoy this recipe, check out my entire 5-Minute Mug Cakes cookbook which includes nearly 100 mug cake recipes, including this one. Recipe now updated with video! You can find all my recipe videos on my youtube page. I prefer my green tea desserts less sweet, but you can add more sugar if you prefer a sweeter dessert. For best results, use premium green tea otherwise your cake won't have the deep green color. aw, thanks! the microwave ones are much easier since it doesn’t brown at all. Can I substitute the nonfat milk for 2%? O. M. G. Matcha is my weakness. Delish! mine too! I love matcha everything! oh i bet it looked adorable in a tea cup! has anyone tried this with oat flour or any other flour besides all-purpose? that’s so great to hear! thank you for sharing! I tried it with Rice flour =) it tasted nice, a bit more rice-y flavour of course and the texture is a bit more powdery than normal flour spongy. But still good. full power. Not sure where you are located, but in the US, just regular full power works. I’d love to include this recipe in a list of matcha recipes I’m writing for Life by Daily Burn. 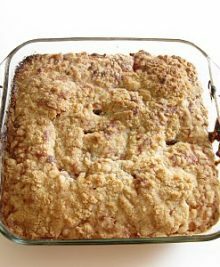 We would feature one of your great photos (with credit line) along with a link back here for the recipe. Can we have your permission to use a photo in this way? Looks delish! 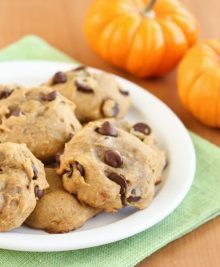 Would i be able to substitute whole wheat pastry flour and almond milk by chance? the milk sub should work, but i dont know about the pastry flour. Can I use plain flour instead? Thanks for this. I found that the minute wasnt quite long enough in my microwave at full power. So I ran it through again – turned out a bit rubbery, sadly. I substituted the milk for soy as I am vegan. I will try it again with some tweaks and hopefully it will turn out better for me. Thanks. I havent tried this with soy. If you do increase cooking time, make sure it’s at small intervals, like 15 seconds, so you dont overcook it. good luck on your next try! This is an amazing recipe! Although, I use soy milk, and add white chocolate chips. I make this so often! Made this tonight and it was quite good. Was a bit dry, but would’ve been perfect with some vanilla or even green tea ice cream! maybe you can use a tad more oil or reduce cooking time a little so it’s not dry. also it tends to get more dry if you let it sit too long before eating it. but i’m glad you liked it! I like this recipe and have included it in my new blog post on 24 must-try matcha recipes. Hi Tanith- no matcha tea bags isn’t the same. 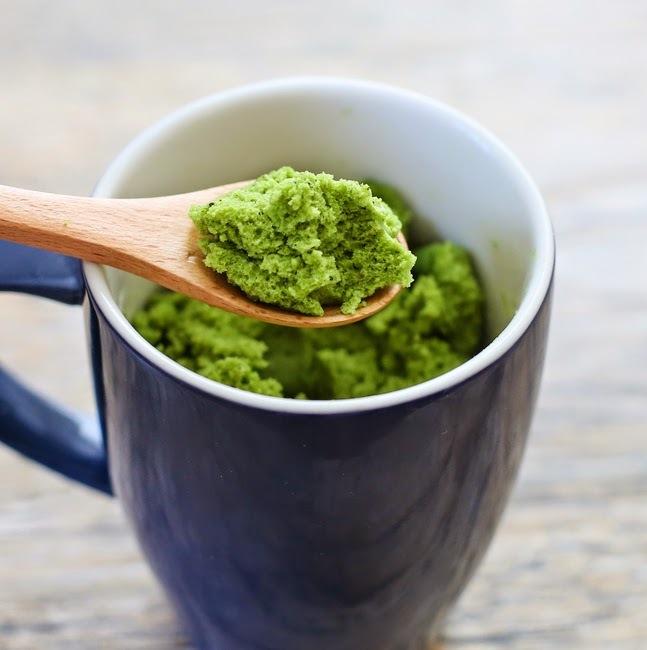 matcha powder is a green powder, usually sold in small canisters at Japanese markets. Amazing recipe! Only thing is that I had to add a bit more milk than the recipe called for – probably closer to 4.5 tbsp. Otherwise, the texture of the mix was way too gooey (couldn’t even get it off the fork I was mixing it in). Love this though, will definitely be making this a lot! did you use something other than fat free milk? that might be why. Whole milk, etc, is a lot thicker and so you won’t have enough liquid and will need to add more. glad you got it to work though! 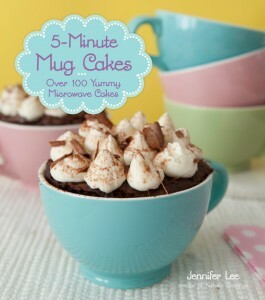 Will decreasing the amount of sugar affect the mug cake(except for the sweetness of course)? Also, when I attempted this, it didn’t rise for some reason. What could’ve gone wrong? decreasing the sugar shouldn’t affect the cake rising. did you check to make sure your baking powder is fresh? Do you know how many calorie is in that mug cake ? i don’t own a microwave, is there an oven version of this? I love your matcha tea mug cake. I will definitely make it again!The matcha tea powder I bought is good but I want the vivid green powder. Can you you recommend any brands that are reasonably priced? Thanks! I buy mine at my local Japanese market for about $10. It’s a little expensive but one canister lasts a while. I will check it out thanks. An Asian market just opened nearby so I can check there too. I substituted unsweetened vanilla almond milk for regular milk, and the taste was fine. Also, the cake tastes wonderful when topped with Justin’s chocolate hazelnut butter. Should I use 2 teaspoons of matcha because mine isn’t as strong because it is 20% matcha on 80% brown rice filler? if I use a toaster oven instead of a microwave, whats the temperature and how long should I bake it? 🙂 thanks! i’m sorry, I have not tried to make it in a toaster oven before. Hello! I’ve made this recipe many times with no success. The batter always turns out too dry. I had to double the milk but it does not become a cake. Does anyone else have this issue? Are you following the recipe exactly, or are there any ingredients you’re replacing/substituting? The batter def shouldnt be dry and doubling the milk will make the cake very gummy. what kind of milk are you using? low fat and fat free work best. also when you measure the flour, do you level off your spoon? you need to be precise with the flour measurements otherwise you’ll have too much flour. I just tried making this tonight, but my cake ended up tasting (and smelling) very flour-y! 🙁 I’d followed your measurements to a tee, too. What do you reckon might have been the problem?? Hi Jacqui- I noticed you are writing from the UK and sometimes the ingredients and measurements are a bit different. What kind of matcha powder did you use? Hey! I want to make this for a friend for her birthday but I can’t find matcha powder anywherez Is there any way I can use tea bags instead? Hi Kirbie! Unfortunately I don’t have a microwave, is there anyway I could make it in the oven? Hi Kirbie, do you have any advice on how long I can store these cakes? I want to keep them in the fridge overnight but will this make them dry? unfortunately, I think they will dry out. I dont really recommend storing these cakes. perhaps you can make the batter and store it in the fridge and then cook it when you need it? I tried your recipe this morning and the cake came out really brown! I used 1% milk and put a 1/4 tsp vanilla extract. Do you have any suggestions on getting the beautiful green colour? sorry to hear that! Make sure you use a good matcha powder. I used a premium one, not the culinary kind. I use maeda-en, the gold premium quality. ohmgmgmgmgmg this recipe is AMAZING i just tried it out 10 minutes ago, i added in just a bit more sugar and chia seeds (since i have heaps just lying around) and trust me – best thing ever. the chia seeds add a little crunch to the cake!! my friend bought me 1kg of matcha powder just a week ago and i was like what am i gonna do with all that? awesome! so glad you liked it! Love the idea of adding chia seeds! This recipe is amazing! And it didn’t explode! And it tastes great! Thanks so much! Thank you SO MUCH for this recipe! I like my stuff a bit sweeter, so I doubled the sugar, and I just saw the comment about adding chia seeds and I’m totally going to try that. This was great. I didnt have milk so I used 3 tbsp of water for this recipe, and it still tasted delish!! Really loved this! Mine did not rise at all. It was rubbery, and when it cooled, it was hard as rock ????. What did I do wrong? I used light olive oil, regular milk, and cooked at medium setting on the microwave for 1 minute. A few things. Check your baking powder. If it’s no longer fresh, your cake won’t rise and will become hard when cooked. Also, I recommend vegetable oil over olive oil, as stated in the recipe. Olive oil leaves an olive oil taste and can cause a more rubbery texture. If you use whole milk, as opposed to fat free which is specified in the recipe, you actually need to add a little water to the batter because whole milk is much thicker. finally, you may want to try different microwave settings. I cooked mine at full power with the microwaves here in the US. I don’t know how powerful the microwaves are where you are coming from. Medium setting may be too high or too low, both of which can affect the outcome. Hi I tried this cake today and it did not rise at all, the batter was very dry. I used self raising flour and added a bit more baking powder too but it was a total disaster. What did I do wrong? Hi, Kirbie! What green tea powder brand did you use? I’d like to ask one more off topic question since I cant find the answer anywhere, yet…the other day I made a green tea pancake, at first the pancake colour was pleasantly bright green, but over time it turned into brownish and the next day, it was super dark brown (almost black). I didn’t store the pancake properly, like in an airtight something because usually normal cake will be fine. I wonder if it was because of the green tea powder or have you experienced this before? What is your opinion? Thank you, Kirbie. I use Maeda-En, either the universal or the ceremonial quality as both of these are pretty high quality and don’t brown as easily when cooked. I have not experienced the browning you described–my matcah items stay the same color even if I leave it out for a few days. That seems so strange! I am guessing that it might be the green tea powder. Hello! I have made this a few times and love it. I have added coconut to it and used Steeped Tea flavoured matchas! Each time has a different taste to it. Thank you for sharing! This is amazing! So quick to do! I’m on a diet low on allergens and really needed a healthy treat. I substituted the milk for vanilla rice milk (had to add a bit more) and used gluten free flour and it worked! Thank you SO MUCH! I love matcha and I will keep coming back to this recipe! I want to try this recipe out but woud it be possible to use stevia? I’m diabetic so I always try and sub. Sugar whenever posssible. This was good but came out with a bit too bitter for me, and I added extra sugar. What would have perfected it was if I had some chocolate sauce to drizzle on. 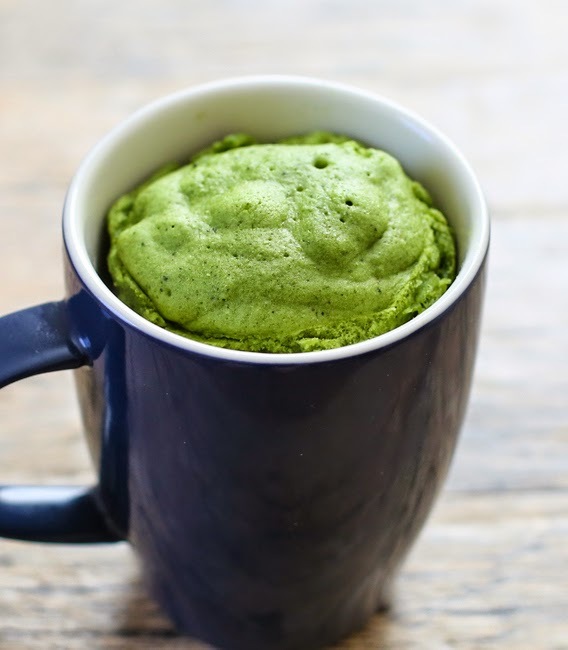 Thanks for making a matcha mug cake recipe that doesn’t need an egg, by the way! I really enjoy the bitterness of matcha but definitely you should tweak it to your personal taste preference and adding a chocolate syrup sounds like a great idea! Hi Kirbie, thank you so much for sharing this recipe! I love matcha and the idea of a quick mug cake, so I tried it right away! I used coconut/almond milk because of dairy allergy and added a little bit of water because the batter was slightly thick. The cake cooked, but didn’t rise. 🙁 It’s possible that my baking powder is old. Should I try with a bit more baking powder? or self-raising flour? I soo want this to work! OMG, This is one of the best recipes I have found on mug cakes, and the matcha cake tasted delicious, I also tried making a chocolate cake today too with the same recipe, substituting cocoa instead of matcha and it came out a success! Hi Kirbie, I just came upon your site on a lazy Sunday afternoon looking for ideas on how to bake with the big can of matcha green tea powder that my hubby bought at Costco (ladies, you should never let your man shop alone at Costco!). The large quantities really brings out their stock up for winter instinct. LOL. Upon reading this recipe, i really thought this was too good to be true. But it is actually true!!! It actually worked and my 7 y,o daughter liked it! I did use whole wheat flour, it’s was a bit “wheaty” but the texture of the cake turned out great. It was like a cupcake in a mug. I’ll be following your blog now!! I’m so glad you liked it! And Lol on husbands shopping alone at Costco. I’m pretty sure my husband would just bring home boxes of sodas and haggen dazs bars! The recipe measurements are correct. Please keep in mind that dry ingredients like flour is measured in weight whereas liquid ingredients like the milk is measured in volume. Please make sure you measure correctly. Made this but used almond flour (doubled to 8tbsp) and coconut milk. I had to cook it for twice as long and it came out dense and moist. Not really a cake but I’ll keep fiddling with the recipe. Still tasty! Using just almond flour is tricky. I suggest doing a mix of almond flour and coconut flour. I’m happy you got this recipe to work for you! Hey ! Really want to make this but I don’t have vegetable oil. Can I use butter instead or canola oil ? Thanks! This is a miracle in a cup! Whoa! Gives me a nice matcha desert fix in one minute! You’re a true genius! When mine comes out a little too dry (if I overcook) I just add a little Yogurt on top! Thanks for an amazing recipe! So glad I found this! I’m so glad you like the recipe! Did these people steal your recipe and photos? They look the same, and it doesn’t look like they credited you. Made this for St. Patty’s Day. It turned out great. Thanks so much!